My article published in Daily News “Economic Insights” on November 1, 2018 covered how banks manage credit in banking business. Credit is the source of creation of national money. 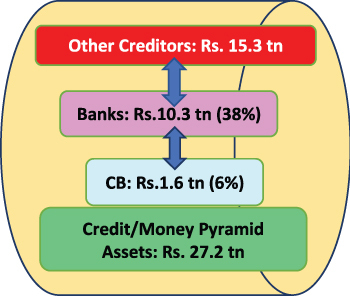 Bank credit is only the middle layer of credit/national money pyramid. The bottom is the credit/money printed by the Central Bank (CB). The upper pyramid contains diverse credit markets, both organised and informal. Financial crises that erupt from time to time are the cracks of the pyramid at systemically important points, i.e., some banks or credit markets or both. Money in the economy is created by risky, pyramidal business of credit. The CB is the guardian of the credit pyramid through the legal tender/currency on behalf of the government. Each currency note in the pyramid is a liability of or credit to the government. Consider following transactions. * The CB lends Rs. 100 to the government and stops any further money printing. * The government takes currency and spends. * Public receive currency (Rs. 100) as income. * The general banking habit of public is that they keep a small portion of income as currency and the balance in deposits at banks for transactions. If the public’s currency holding is 10% of income, Rs. 90 is deposited at banks. * Bank business is the lending out of deposits after keeping a portion of deposits as reserves with the CB (statutory reserves, 7.5% at present) and at hand (e.g., 3.6% for internal payments). Therefore, banks deposit Rs. 6.75 at the CB, retain Rs. 3.25 at hand and lend the balance Rs. 80. * Bank borrowers (households, companies, investors and government) spend the proceeds of bank loans. * The money so spent is received again by public as their income. They keep 10% as currency and deposit the balance Rs. 72. Therefore, Rs. 72 out of Rs. 80 loans have become new deposits. * The national money at this stage is Rs. 262 (i.e., Rs. 100 in currency and Rs. 162 in deposits), i.e. Rs. 100 printed and Rs. 162 created. * The same process continues on new deposits of Rs. 72 also several rounds between lending and deposits. This creation will stop when total Rs. 100 of currency is completely absorbed into currency holdings of the public and reserves of banks as no further credit can be granted by banks due to non-availability of currency reserves to be kept for new deposits. The time taken/speed to finish the process depends on banking habits. If banks reduce reserves, they can further expand credit and deposits. At the end, the public will hold more money than money printed by the CB due to creation of money. The CB is the printing layer for grant of credit to and purchase of foreign exchange from banks and government. The purchase of foreign exchange is also credit as the CB has to sell it back when demanded for foreign payments. The CB buys foreign exchange without letting the currency to appreciate in the market. When same foreign exchange is demanded later, it is not proper for the CB to suddenly decline it and let the market to determine the currency value. Banks grant credit depending on the public’s banking habits and demand for credit by various sectors of the economy for consumption and investments determined by the macroeconomic momentum and expectations. Nobody can have a correct economic model or divine wisdom to determine the volume of national money required or desirable to fuel a level of the macroeconomy, as measured by the growth or employment or general price level or any other variables, desirable for the public. If something is produced too much than needed, its price will plummet causing bankruptcies. The same applies for national money too. Therefore, the control of national money stock is a need-based judgement to keep the economy going without confronting bankruptcies. The national money also is a product that has a value/price determined by demand and supply. This value has two components. First is the recovery value of underlying credit which depends on credit risk. The second is the purchasing value or what credit/money can buy which depends on inflation risk. The price actually charged is the interest rate on credit to cover both risks. The higher the risk, the higher is the interest rate. Therefore, national money management involves in managing the volume of money/credit at a reasonable degree of two risks. Deposits perform as money only if borrowers repay underlying credit. The credit or default risk varies across banks. The CB also does not have means to redeem all paper currency and foreign exchange. The excessive currency depreciation is partly about poor repayment of foreign exchange. The general public confidence keeps the credit pyramid performing as the public rarely demand their money in herd. The prudential regulation largely keeps the confidence and banks safe and sound, but never guaranteed. Therefore, the public also need to be patient and prudent in managing their money to control underlying credit risk within their appetite. Unmanaged credit risk cracks the credit/money pyramid. Runs to banks in herds serve no purpose other than bankruptcy to all. Inflation risk occurs when prices in general in the economy are to rise. The domestic value of money and international value of money are the two concepts that separate the inflation risk between domestically produced goods and services and imports. In modern economies, no pure domestic inflation can be calculated due to international trade and global value chains. Therefore, inflation is a risk combined of both domestic and foreign factors. The recent excessive currency depreciation is a good experience how unmanaged national money gets eroded in value due to inflation risk. Unmanaged inflation is a risk to living standards of fixed income earners being the majority public. Protracted deflation also is a risk as it causes economic recession, e.g., Japan, the US and Europe during the past decade. As such, national money management is part and parcel of the national economy management as the money fuels the economy. 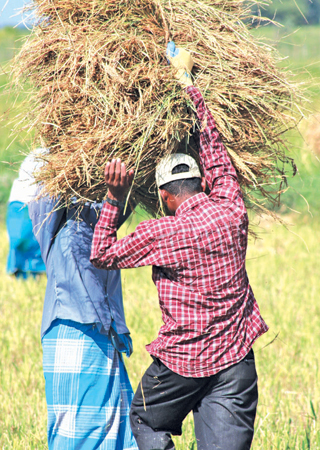 The CB is the authority for policies to manage both risks of national money in Sri Lanka. Prudential regulation and monetary policy are the mutually supportive mandates. The Monetary Law Act has provided a wide framework for the past 67 years to manage both national money and national economy. Therefore, risks to national money and economy can be exacerbated by the failure of the CB too. We need to review whether our credit pyramid is effective to minimize risks and promote the quantum of macroeconomy desirable. All advanced economies have got to this stage by managing the wider credit pyramid to cater to various sectors of the economy irrespective of the scales. Sri Lanka also had an active credit delivery policy through the banking system until early 2000s. The policy had specific focus on sectors of the economy based on setting up of development credit institutions, the CB refinance, foreign credit funds and bank credit for rural agriculture, small and medium industries, self-employment, export industries, rural housing, etc. Securing the objectives of economic and price stability and financial system stability, with a view to encouraging and promoting the developments of productive resources in Sri Lanka as the authority responsible for the administration, supervision and regulation of the monetary, financial and payments system of Sri Lanka by actions authorized in the MLA. i) Regulate the supply, availability and cost of money as to secure, so far as possible for above objectives, having regard to the monetary needs of particular sectors of the economy as well as of the economy as a whole. ii) Determine domestic monetary policies especially by considering their effects on Sri Lanka’s international financial position as evidenced by the relation of domestic to world prices and costs, by the level and composition of exports and imports, by the international balance of payments, and, ultimately, by the ability of the Central Bank to maintain the international stability of the Sri Lanka rupee and its free convertibility for current international transactions. Determine the international monetary policy to maintain the par value of the Sri Lanka rupee or exchange arrangements as are consistent with the underlying trends in the country and so relate its exchange with other currencies as to assure its free use for current international transactions. Fixing the maximum percentage of loans to be extended to any identified sector of the economy by commercial banks or specialized banks. Actions in respect of a bank insolvent or likely to become unable to meet demands of its depositors or that its continuance in business is likely to involve loss to depositors and creditors. There is a large number of policy actions permitted to the MB/CB for above duties. Despite above mandates, significant problems in the volume and distribution of national money across sectors continue. The depreciating currency is a fine eye-witness for huge loss to public’s funds due to sudden CB decision without pre-research to let the market mechanism to determine the exchange rate without due regard to requirements of the MLA. Everybody knows the difficulty in getting credit to micro and SME sector. Modern private credit channels remain suppressed due to stringent definition of deposits and unfriendly regulations which make almost all investment trusts unauthorized deposit-takers. The monetary policy remains inappropriate for an active credit/money pyramid. First, the policy is unreasonably focused on flexible inflation targets monitored from the weather and subsidy/administrative prices-driven cost of living index. Second, the overnight inter-bank interest rate target-based bank liquidity management is adopted to transmit the monetary policy to the wider credit pyramid without any assessment of sectoral credit needs. The CB does not have empirical research on success of its policies to manage national money and economy within the MLA. Even the US Fed has credit and regulatory policies to promote wider credit delivery to address sectoral credit needs. 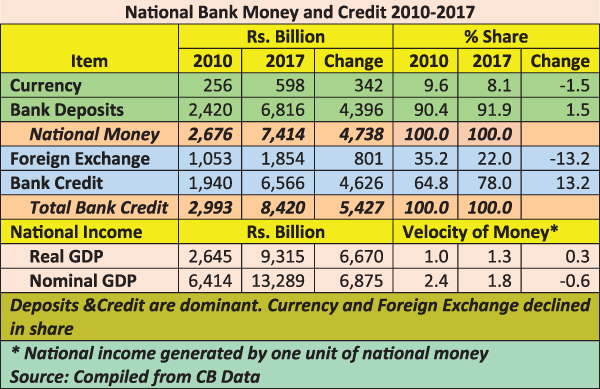 The current monetary policy model is a result of the CB modernized for a lean central bank in early 2000s as recommended by the IMF/World Bank in western versions although the CB was the central bank of Sri Lanka. Western central banks have changed their monetary policy version to aid recovery from the global financial crisis 2007/09. When the initially modernized monetary policy framework was submitted to former Governor A. S. Jayawardena in December 2000, he commented “this sounds like changing the pillow for headache!”. The CB’s modernization eorked only for a lean monetary policy by abandoning active credit channels while all concerned agency functions continued with huge conflicts of interests and irregularities. Therefore, we need to reactivate the full potential of the Sri Lankan monetary policy to serve for all economic sectors in compliance with the MLA. Without innovating the pyramid’s core, the government cannot promote it with ad-hoc credit schemes through state banks. Therefore, we need to have a strong policy discussion. The CB’s young economists who have interests in the country need to rethink and start economic research to assess sectoral credit and economic needs (under section 25 of the MLA) and implement monetary and regulatory policies to promote a credit pyramid that can serve the majority public while preserving its stability. There are ample success stories from the world. Those are not rocket-sciences, but ways of doing things for the benefit of wider public. Otherwise, the present economic management model of gambling on children would be catastrophic.